Also serving communities of Altoona. There are 48 Assisted Living Facilities in the Eustis area, with 6 in Eustis and 42 nearby. The average cost of assisted living in Eustis is $3,050 per month. This is lower than the national median of $3,346. Cheaper nearby regions include Mount Dora with an average starting cost of $2,700. To help you with your search, browse the 310 reviews below for assisted living facilities in Eustis. On average, consumers rate assisted living in Eustis 3.9 out of 5 stars. Better rated regions include Tavares with an average rating of 4.1 out of 5 stars. Caring.com has helped thousands of families find high-quality senior care. To speak with one of our Family Advisors about assisted living options and costs in Eustis, call (855) 863-8283. All Stars Assisted Living Inc.
Review of Pendry Estate, LLC. Eustis, Florida, is located in the middle of the state, approximately 40 miles northwest of Orlando. Eustis has a senior population of approximately 21 percent and is served by 60 assisted living facilities (ALFs) in the area. ALFs in Eustis are defined and regulated by the Florida Department of Elder Affairs and are officially designated as "centers that provide residential services, nursing care or mental health care." ALFs throughout Florida are licensed by the Florida Agency for Health Care Administration. One of the benefits of assisted living in Eustis is that the state of Florida does not require personal or state income tax. Because Social Security is also exempt from taxation, seniors are often drawn to the area for financial flexibility. Eustis experiences long, hot summers with temperatures ranging between the 70s and 90s. Winters are short and rarely dip below 50 degrees. For seniors looking to escape harsh winters and cold weather, Eustis could be an ideal option for assisted living. The Eustis area has no facilities from which to choose in the event of a medical emergency or illness, with the nearest major hospital located in Tavares. Eustis has an array of community resources for seniors, including the Eustis Senior Center, an organization that offers socialization and entertainment through congregate meals, programs and other services. The Eustis area is serviced by LakeXpress, Lake County's fixed route public transportation system. Half-fare prices are available to seniors over the age of 60 or who hold a valid Medicare card. The nearest major airport to Eustis is Orlando Sanford International Airport, around 35 miles away. A senior's chance of becoming a victim of either violent or property crime in Eustis is one in 29. This means that crime rates in Eustis are 73 percent higher than the average crime rates cities of all sizes across the state of Florida. Seniors who plan to spend time outside or travel alone after dark should consider Eustis' crime rates when contemplating assisted living in the area. Assisted Living costs in Eustis start around $3,050 per month on average, while the nationwide average cost of assisted living is $4,000 per month, according to the latest figures from Genworth’s Cost of Care Survey. It’s important to note that assisted living rates in Eustis and the surrounding suburbs can vary widely based on factors such as location, the level of care needed, apartment size and the types of amenities offered at each community. 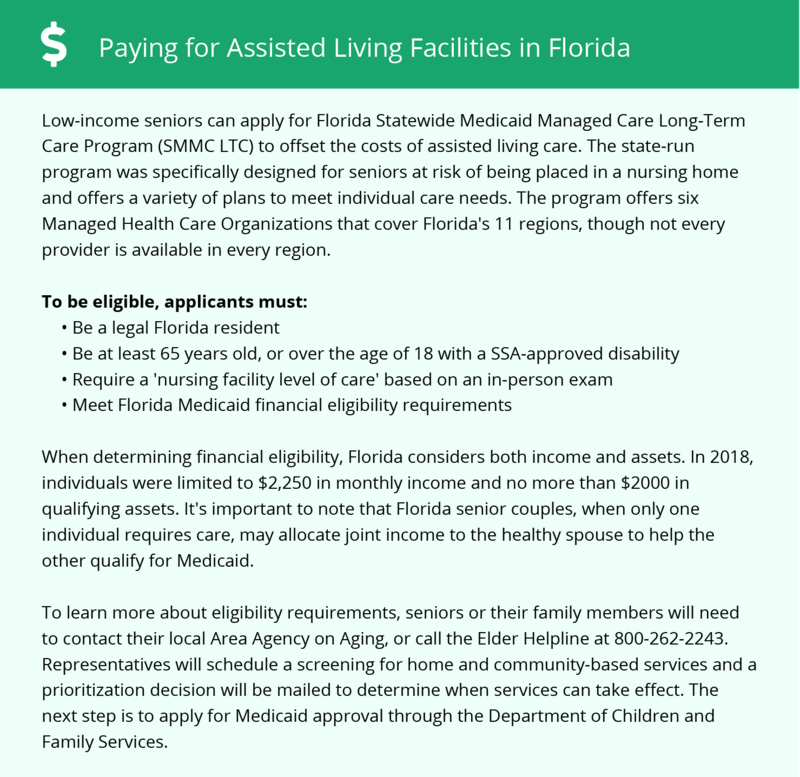 The Florida Statewide Medicaid Managed Care Long-Term Care Program (SMMC LTC) provides financial assistance for assisted living costs in Eustis to qualifying seniors. Florida also finances specific ALF services through a statewide 1915(b)(c) MLTC program to waiver participants under certain restrictions. To see a list of free assisted living resources in Eustis, please visit our Assisted Living in Florida page. Eustis-area assisted living communities must adhere to the comprehensive set of state laws and regulations that all assisted living communities in Florida are required to follow. Visit our Assisted Living in Florida page for more information about these laws.